At Melloy Dodge on Coors Blvd in Albuquerque, April means special savings on Dodge Darts! We have just a few 2013 new Darts left on the lot, with $2500 cash allowance. Use that toward your down payment and it's like free money! To qualify for this rebate, you must take retail delivery by April 30, 2014. We also have financing as low as 0% for up to 60 months on qualifying Darts, or 1.9% on 72 months, OAC. This great financing is offered through Chrysler Capital, with a 10 percent down payment. If you have good credit and qualify for the 0% offer, your monthly payment per $1,000 financed is just $16.67. These offers apply to the Dodge Dart Limited, the Dart GT, the Dart SXT or the Dart SE. The 2014 models offer the same great financing. Incentives of a $1,500 cash allowance are also available for New Mexico car buyers on the 2014 Dart Aero, Dart GT, Dart Limited, or Dart SXT. The Dodge Dart SE has a $500 cash allowance. Combine that rebate with the Dart SE's internet price of just $17,840 and you've got a great car at a really great price! Shop our selection of Dodge Darts on at www.MelloyDodge.com/Shop-Dodge-Dart. 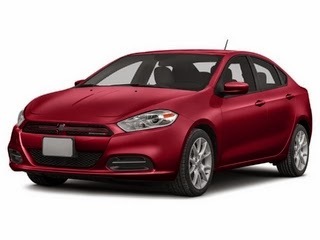 During April's "Showcase Season Event", you can also lease a Dodge Dart from just $199/month. Learn more about that on our current TV commercial. www.YouTube/Melloy-Dodge-Dart. The 2014 Dart gets up to 41 mpg and has been named the Most Technologically Advanced Car in its Class, based on Ward's Small Upper Sedan vehicle segmentation costing under $25,000. In 2013, Dodge Dart was an IIHS Top Safety Pick, and winner of Strategic Vision's Total Quality Award for Best Small Cars. Stop by and see the Dodge Dart at Melloy Dodge, New Mexico's family-owned Dodge dealership serving Albuquerque, Rio Rancho, Santa Fe, Belen, Los Lunas and surrounding cities. We're located at 9621 Coors Blvd. NW, just north of Paseo del Norte on Albuquerque's west side. We've been New Mexico's number one selling Dodge and Ram dealer the past few years because we focus on our customers.